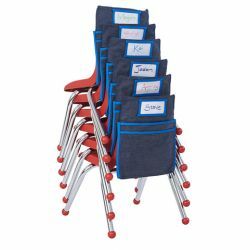 Includes (6) 14" Stack Chairs with Classroom Seat Companions. Denim Seat Companion slips over the back of the chair to keep notebooks and supplies within reach. Specify seat color.